۱ Area and population values do not include Missouri and Kentucky nor the آریزونا. 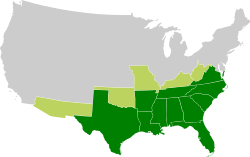 آمریکایِ کنفدراسیون ِایالات یا آمریکایِ مؤتلفه ایالات (انگلیسی جه: Confederate States of America) یازّه‌تا جنوبی ایالت نوم بی‌یه که آمریکای متحده ایالات جه میون سال‌های ۱۸۶۱ تا ۱۸۶۵ میلادی سیوا اداره بینه. جفرسون دیویس این گادِر که آمریکا دله‌یی جنگ انجام بی‌یه، رییس جمهوری مقوم ره کنفدراسیون دله داشته. هیچ کشوری ونه کنفدراسیون ره برسمیت نشناسی‌یه و نهایتاً ونه ارتش اتا جنگ دله شکست بخارده و وشون مجبور بَیینه دِباره متحده ایالات دله عضو بَواشِن. ویکی تلمبار دله بتونّی پرونده‌ئونی که آمریکای کنفدراسیون خَوری دَره ره پیدا هاکنین. ↑ کولتر، الیس مرتون. The Confederate States of America, 1861–1865 Retrieved 2012-06-13, published in LSU's History of the South series, on page 118 notes that beginning in March 1861, the Stars-and-Bars was used "all over the Confederacy". ↑ Sansing, David. Brief History of the Confederate Flags at "Mississippi History Now" online Mississippi Historical Society. Second National Flag, "the stainless banner" references, Devereaux D. Cannon, Jr., The Flags of the Confederacy, An Illustrated History (St. Lukes Press, 1988), 22–24. Section Heading "Second and Third National Flags". Retrieved 2012-10-04. ↑ Sansing, David, Brief History of the Confederate Flags at "Mississippi History Now" online Mississippi Historical Society. Third National Flag, "the bloodstained banner" references 19. Southern Historical Society Papers (cited hereafter as SHSP, volume number, date for the first entry, and page number), 24, 118. Section Heading "Second and Third National Flags". Retrieved 2012-10-04. Wikipedia contributors, "Confederate States of America," Wikipedia, The Free Encyclopedia, http://en.wikipedia.org/w/index.php?title=Confederate_States_of_America&oldid=162627066 (accessed October 6, 2007).